Although presidential candidate Donald Trump may have no experience in government, he is an expert in making great television — this is a man who once shaved a CEO during a wrestling match. One of Trump’s biggest complaints about the process of picking a president — and he has many — is that it is so relentlessly boring. He has tried to alleviate these problems by appearing on TV as much as possible, selling exciting merchandise inspired by his hit 2016 programming, and giving all Americans the hope that they might achieve the impossible and get a chance to ride in Trump’s helicopter. However, great leaders must sometimes make great sacrifices, and Trump’s latest victory shows that he is willing to do the unthinkable if it would prevent his future constituents from ever being bored — the one emotion that Trump has promised to banish from this Earth evermore. Last night, Trump got results for his supporters — and for everyone else who was praying that the gods might give them something else to watch besides Donald Trump for an hour. The battle began last month, when Trump realized the American people would have to suffer through a three-hour-long Republican debate — which, according to his calculations, contains about the same amount of boringness as a two-hour-long Democratic debate. When CNBC announced that the next GOP debate on October 28 would also be three hours long, he unleashed all the power at his disposal as a candidate with a mighty brand, if no actual political authority. He complained — and, even more menacingly, threatened to boycott the debate if CNBC did not give into his demands, depriving them from the only reason they were able to make so much ad money off that extra hour of programming to begin with. He complained on TV, and he got his opponents to complain. Hours later, CNBC gave in to Trump’s demands. 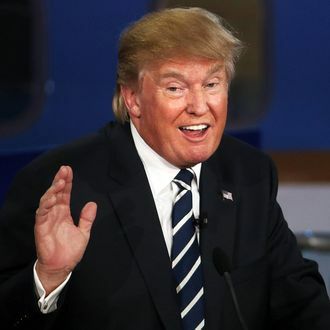 Thanks to the sheer executive power of the one-man show his facial expressions are preparing as counterprogramming for the upcoming debate, the American people would no longer be bored — even if that victory was bittersweet, as it also meant that an hour of Trump TV time has evaporated from Earth forever. This is only the beginning of what a Trump presidency could accomplish when it comes to complaining enemies into submission and eradicating boredom from the airwaves. If Trump is elected, maybe he will be able to do away with the boring Oscars, Emmys, cable-news shows, local-news shows, and football games, too, calling on his Great Secretary — head of the Great Department — to make everything entertaining again. Instead of weekly web videos from the president, we’ll just get a weekly reality-TV show, where one federal appointee gets fired every week — even shrinking the government can be entertaining! By the time his reelection rolls around, debates will feature a talent competition, allowing Ben Carson to operate on a stage live on TV, Jeb Bush to magically make an entire audience fall asleep in under five minutes, and Donald Trump shaving Treasury Secretary Carl Icahn during his closing statements. Trump has also imagined a future where he doesn’t end up in the White House, and instead is slowly pushed out of the race by the Establishment plate tectonics of a GOP primary. He conjured a terrifying, "boring" world full of yawns to the New York Times earlier this month. “There’d be a major collapse of the race, and there’d be a major collapse of television ratings," he said. "It would become a depression in television. I wouldn’t even be watching it probably, and neither would anybody else."